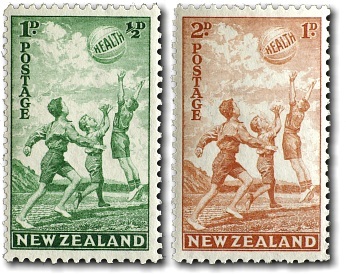 For the 1940 health several designs featuring children were submitted with one design featuring a triangular stamp design. The Government Printer opposed triangular stamps as they would be hard to arrange on a plate and there was also concern that post office workers would have trouble separating the stamps. In late May 1940 the Director-General made a recommendation to the Postmaster-General that portraits of Princess Elizabeth and Princess Margaret would "prove eminently suitable". This required permission to use their portraits, an assurance that the stamps would be printed in time for the October issue and advice whether perforating the triangular stamps would be possible. On July 24th the Postmaster-General was advised that "owing to the development of the war situation and the possibility of there being difficulty in obtaining prompt delivery of the stamps from England, further consideration was given to the matter and it is now understood that the Prime Minister wishes stamps of the same design as those of last year to be used this year." At this stage new plates were produced with the same design as the 1939 Health stamps but with the correct increased postal rates from 1939 included.